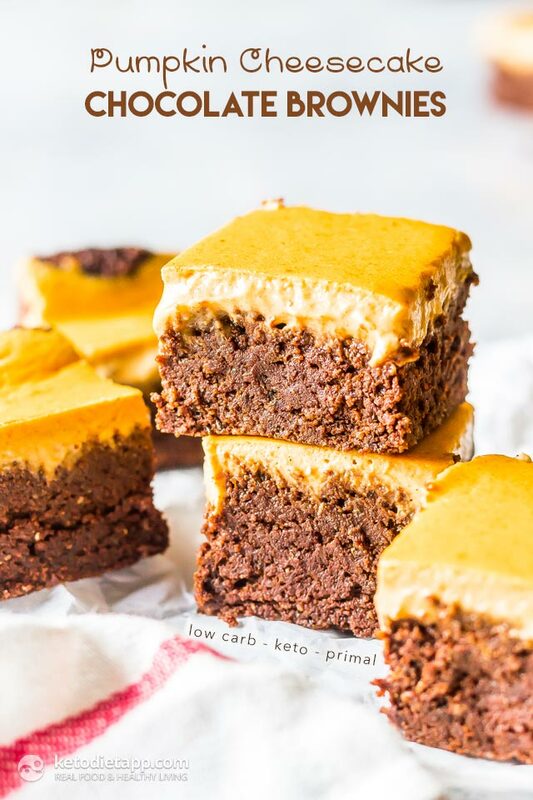 Perfect for fall these keto pumpkin cheesecake brownies have a fudgy brownie base with a creamy pumpkin cheesecake topping. I don’t know about you but I’ve always loved brownie mashups, in college I used to make brownies that had a cookie base, then the brownies, then raw cookie dough on top all covered by a layer of hard chocolate. Talk about a sugar crash, those were the days. These low-carb brownies are much, much healthier (well, as healthy as a brownies can be) but absolutely have way less sugar and carbs. 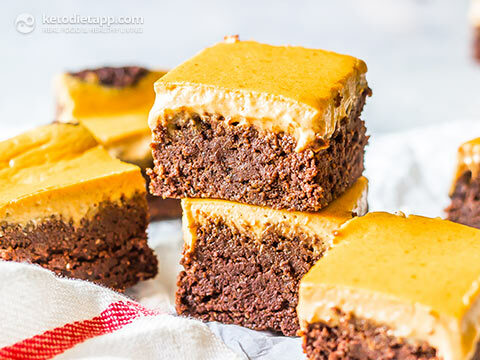 This recipe is based on Martina’s Fudgy Keto Brownies. Preheat oven to 175 °C/ 350 °F and line a 20 x 20 cm (8 x 8 inch) square pan with parchment paper. Break the chocolate into small pieces and add it and the butter into a small bowl placed over slowly simmering water. When most of the chocolate has melted, remove the bowl and stir the chocolate. Place the eggs, stevia and powdered erythritol into a medium bowl and mix to combine. Next beat in the chocolate. 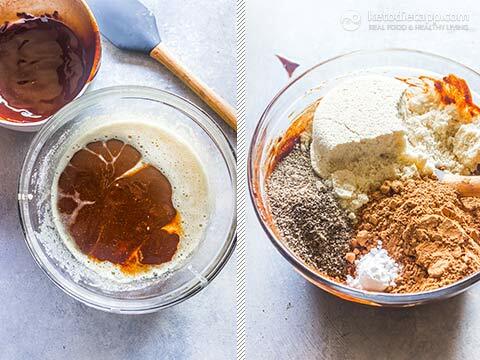 Add in the dry ingredients and mix until smooth. 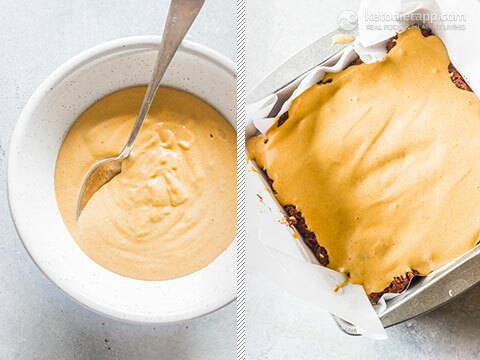 Make the cheesecake layer by adding all of the ingredients to a medium bowl: cream cheese, egg, pumpkin puree, Erythritol, cinnamon, vanilla extract and ginger. Mix until smooth. 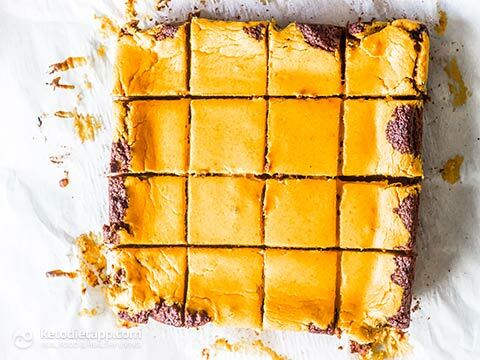 Spread the thick brownie batter into the pan, top with cheesecake mixture and bake for 15-20 minutes. Cool in the refrigerator until set. Cut into 16 squares and serve.